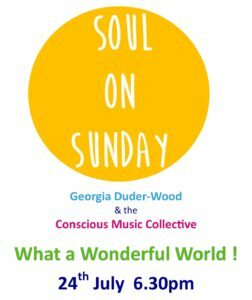 We welcome back Georgia Duder-Wood & the Conscious Music Collective, performing original compositions & jazz/soul classics for inspiration, connection & reflection. Musicians paid a small fee. 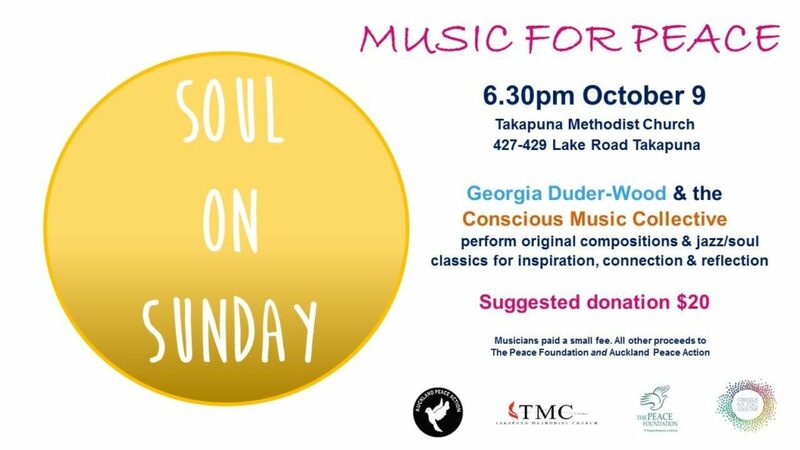 All other proceeds to The Peace Foundation and Auckland Peace Action. A free event where local people can bring broken and damaged items, get them repaired and learn how to fix them themselves in the future. Small Electrical Appliances – Bikes – Clothes – Toys – Small pieces of furniture. Email: stephen@ancad.org.nz or call: 022 390 7199 if you’d like to know more or ask about a particular item. A jazz and soul programme of songs celebrating nature and her gifts. Jazz Vespers is a new take on an old church service. Vespers was held in the evening, as part of the traditional daily services of the church, and served to bring the day to a spiritual end with music, prayer and repose. 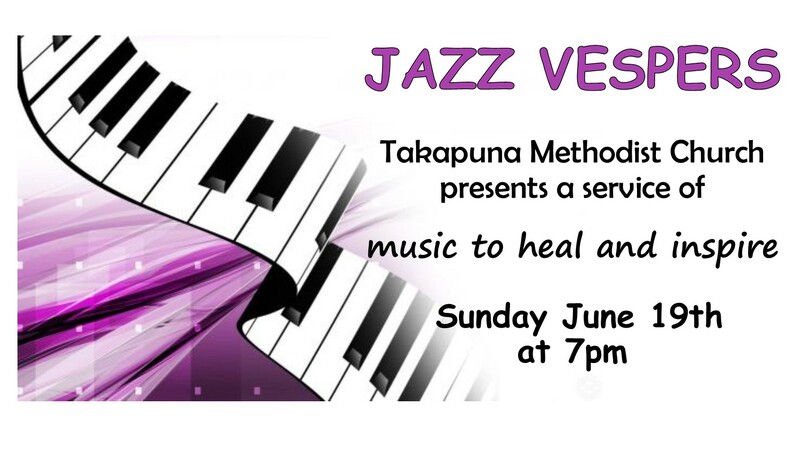 Such a service, but using the jazz musical genre, will be taking place on Sunday 19 June, at 7.00 pm in the Takapuna Methodist Church, and all are welcome. Key to the service is the music, and this will be led on piano and organ by Barry Brinson, a well-known jazz pianist and organist. There is to be a specially formed small jazz choir, and contributions from the two excellent singing groups from Takapuna Grammar School, Skat-a-Tak and Bop-De-Wop. These young people will be fresh from singing their hearts out at the NZ Choral Federation’s “Big Sing” Festival in Auckland. 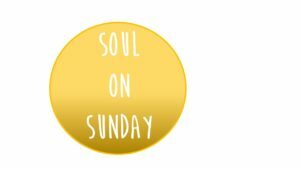 The service itself will comprise well known jazz standards, arranged for the choir by Barry, and intermingled with poetry, prayer and thoughts for the day. The choice of pieces reflects the spirituality available in jazz. There will also be opportunities for the congregation to swing along with the musicians, and Barry will be playing some of his own jazz compositions and arrangements on the big TMC pipe organ. A collection will be taken to cover costs, and to contribute to the Church’s social service programme. The use of the jazz style in church services is not new. The United Church of Canada, St Andrew’s Wesley Church has a Jazz Vespers every week, and the Baptist Churches of the southern United States and elsewhere where African Americans gather, are well known for this form of musical worship. Come and join in. The combination of clarinet and organ is unusual but surprisingly successful. They will be performing a deliciously varied programme for clarinet and organ chosen from Mozart’s Concerto and « Quintet », LaTraviata Fantasy, virtuoso Variations by Beethoven and Rossini, and « Se Canto » (the ‘National Anthem’ of the South of France), Jazz (Bechet, Goodman…) and especially exciting Klezmer highlights. The 2014 NZ tour was such a success, with audiences alternately moved by the beauty of Andrei’s playing, staggered by his virtuosity and excited by his very lively performance of popular music, he has returned for another season. This is an opportunity not to be missed. There may not be another chance. Put this date in your diary and come and support this very talented duo. Watch this space for more information in due course. Christopher HAINSWORTH, distinguished New Zealand organist and long-term resident of the south of France, is known for his imaginative and entertaining programming. 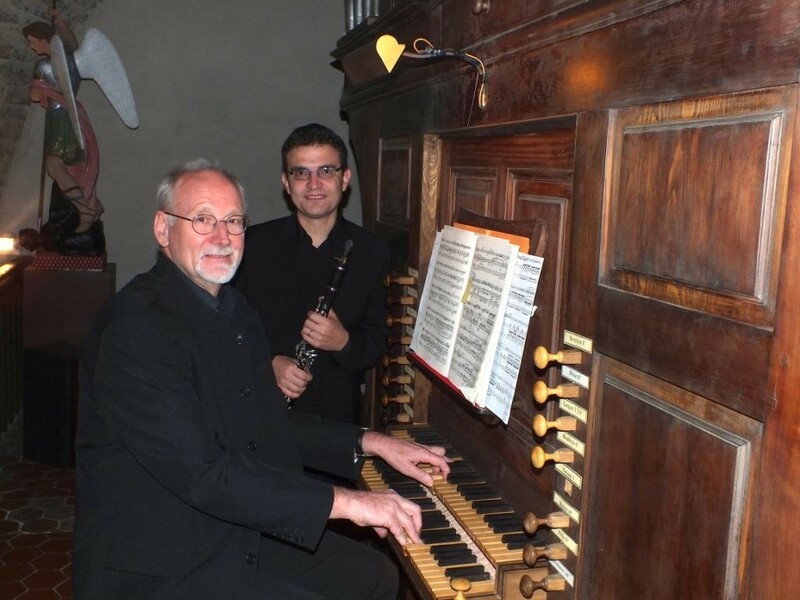 Formerly Associate Professor and Head of the Department of Music in Waikato University now Organist of Beziers Cathedral, has been free-lancing in Europe for 30 years. More here>. Andreï FREÏDINE studied in Russia before moving to France, where he obtained his Premier Prix (1993) and Prix d’Excellence (1994) at the Versailles Conservatoire. He has performed in Germany, Austria, Bulgaria and Russia. Andrei now teaches clarinet and Computer Music Studies at the Beziers Conservatoire. He also records a variety of artists in his studio and works on acoustic projects for Eurocontrole. More here>. 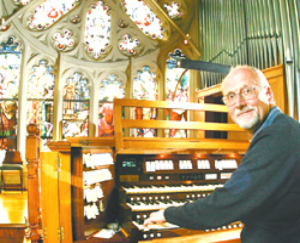 Martin, the Christchurch City Organist, is an international recitalist who believes in promoting entertaining organ music to a wide audience has just returned from a European concert tour. He has delighted audiences the world over with his spirited playing, lively personality and entertaining repertoire. The concert was supported by the Auckland Council Creative Communities NZ. Admission by program. A donation ($20) requested to support the refurbishment and maintenance of the Organ. 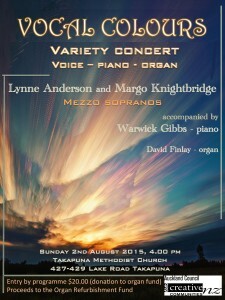 This variety concert, entitled ‘Vocal Colours’, was presented by mezzo-sopranos Lynne Anderson and Margo Knightbridge, accompanied by pianist Warwick Gibbs, and will also included an organ solo given by David Findlay an upcoming young organ student. For this concert of vocal and keyboard variety, the singers performed a programme of solos and duets, covering music from the sacred repertoire, folk song arrangements, parlour ballads and popular song. Lynne Anderson and Margo Knightbridge are experienced performers with many years of involvement in choirs, opera and musical theatre. Margo is a co-founder of Orlando Singers and both are members of the vocal trio Three Mezzos and also perform as independent soloists. Warwick Gibbs is a teacher of the piano, an accomplished pianist and accompanist and works with singers, string players and choirs. Proceeds were applied to the Organ Refurbishment Fund. Admission by programme at door: Proceeds to the Organ Fund. Based in France, Christopher has become a regular visitor back to his home country of New Zealand, performing concerts with outstanding skill and showmanship. Chris studied organ with Ernest Jamieson (St. Mark’s Church, Wellington), Maxwell Fernie (Westminster Cathedral, Victoria University and St. Mary of the Angels, Wellington) and subsequently with Jean Ferrard (Professor at the Conservatoire of Brussels). 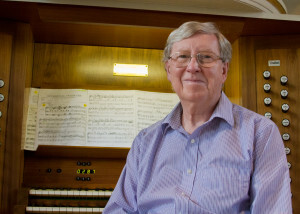 After specialized studies of French Classical organ and harpsichord music (the latter with Paule van den Driessche and Scott Ross), the symphonic organ repertoire and the fortepiano, Chris has been free-lancing in France and around Europe for 30 years, often travelling with his fortepiano or harpsichord. In 2004 he was the Recitalist at the NZ Organ Congress. Chris has also been Associate Professor of Music at Waikato University, Director of Beziers Conservatoire (France), Director of Music at Hamilton Cathedral and Organist of Beziers Cathedral (his current position). Chris is also keen on popular music and accompanying silent movies. He has twice performed at the Saint Tropez Antipodean Film Festival and in 2008, following successful performances in London, Paris and around New Zealand, he was invited to accompany a New Zealand silent film at the Wroclaw International Film Festival.